Pretty pink glazed Blood Orange Bundt Cake. Tender with a burst of citrus, be sure to make this blushing beauty while blood oranges are still in season! For a time longer than I can comfortably admit, I was so confused between pound cakes and Bundt cakes. Okay, I might still be a little confused. But to my understanding, the only real difference is the pan. Bundt is actually a trademarked name by Nordicware and is more representative of the shape rather than the cake (since other types of cakes besides pound cakes can be made in the pan). This got me thinking – does the texture of the cake change depending on the type of pan it is baked in? If you think about it, there is reason to believe that yes, the texture may change between a cake baked in loaf pan vs Bundt pan vs round layer cake pans. They are all different shapes, hold different amounts of batter, and will require different bake times, so you could probably conclude that the results may vary. In my own experiment, the deeper, heavily fluted Bundt pan (used for the cake in these photos), yielded a cake that was a touch denser and not nearly as moist as the same recipe baked in a more classic Bundt pan. Not only did the more decorative cake need an additional 10 to 15 minutes in the oven, according to this article, the leavening agents probably had to work harder in the deep pan and may not have been as effective – resulting in a denser crumb. Both were delicious, but the cake photographed did dry out faster than the other. Pre-heat oven to 350 degrees. Liberally grease then flour all of the nooks and crannies of a Bundt pan and set aside. In the bowl of a stand mixer, beat the butter with the paddle attachment on medium speed until smooth. Meanwhile, rub the citrus zest into the sugar with your fingertips until fragrant. Add the sugar (and zest) to the butter and cream together on medium-low until light and fluffy, 3 to 4 minutes). Stop the mixer and scrape down the bowl. With the mixer on low, add in the eggs and yolk – one at a time. Add in the oil and mix until combined. Stop the mixer and scrape down the bow. With the mixer on low, carefully add in the half of the dry ingredients. Once combined, add in the sour cream, milk, and orange juice. Add in the remaining dry ingredients and mix on medium-low until the last bits of flour are incorporated. Pour the batter into the prepared pan. Bake for 45 to 55 minutes, until a thin knife inserted into the center comes out clean. Cool for only 10 to 15 minutes – or until just cool enough to lift the pan without burning your fingertips. Place a cooling rack or cutting board on top of the cake (the bottom) and flip the cake pan right-side up to unmold the cake. The cake should still be warm or it may stick to the pan if cooled for too long. Loosen the edges gently with a flexible rubber spatula, but refrain from running a knife around the edges or you may cut into the sides of the decorative cake. Whisk together the juice and sugar until they form a smooth, thick glaze. Add more juice and/or sugar until desired consistency is achieved. Are you an expect Bundt maker? Please share your wisdom!! I'll admit - I am currently living a caffeine-fuled life. Now that I am no longer pregnant and am running around everyday slightly very sleep deprived, coffee is my beastie. I've always been a moderate coffee and tea drinker, but now that I'm a mother, I totally understand moms and their caffeine dependency. Before having a child, I never quite grasped the urgency in other moms stating how they "need their coffee" or "don't talk to me before I've had my coffee," and the like. I always knew having child would change everything including sleep patterns, but I am starting to finally get it. If I am being completely honest, then I will confess that Baby Huff is actually a pretty good sleeper and I know we've lucked out a bit in that department - but unless I want to spend my days tending to a newborn as a walking zombie, you better hand over that cup of caffeine. I've always had sleep troubles, so I am used to regulating my caffeine intake. No coffee after 2pm - no black tea after 5pm. Drink plenty of water with each caffeinated beverage, blah blah blah. Now however, my insomnia issues have been traded in for breastfeeding - keeping the caffeine-intake tango still alive and well. What I am saying is, now when I crave that cup of coffee more than ever, there are still some things to consider before pounding an entire french press in one sitting. Fortunately, I have experience in this. If I have a cup of green tea to perk me up in the morning, then I can indulge in an extra-frothy latte or grande americano should we make it out of the house that afternoon - and vice versa. If I have the morning shift that day (yes, my amazing husband and I take turns waking up early with our little snuggle bug) and have lost track of how many Keurig cups I've consumed, then I can always go with a delicious Matcha Latte as my afternoon treat. For years now, I've been pretty enamoured by matcha. In a drink, in a dessert - either way, I am totally intrigued. I love matcha in Japanese desserts - they tend to be light and not-so-sweet. I equally love a matcha latte - with its unmistakable flavor of a creamy, sweetened green tea. I first came across real matcha (as opposed to just green tea) while in Tokyo nearly a decade ago. Thankfully for the rest of us, matcha and matcha-flavored items can be easily found everywhere these days. There are even matcha Kit-Kats, for crying out loud! Recently, I splurged on a tin of my own matcha powder. It was pretty pricey, but I knew I would get good use out of it by making my own lattes. I was wrong. I've tried and tried, but my homemade matcha lattes end up tasting like grass. Thankfully there is more than one use for the stuff besides beverages. Since I had the tin sitting in my kitchen, I was determined to find new ways to incorporate the unique flavor into my recipes. Last year I made Matcha Sesame Macarons and you will even be able to find an awesome Matcha Ganache in my book next spring. 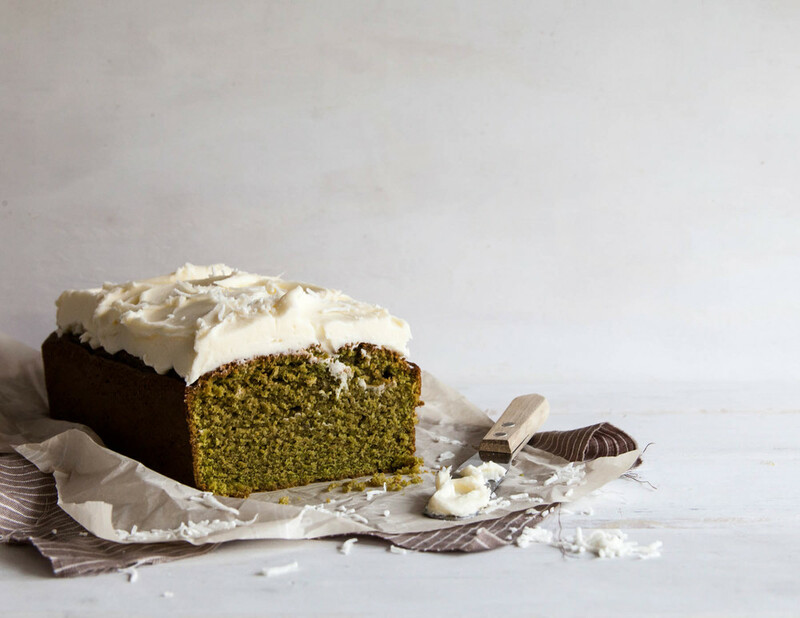 But today, it is all about this Matcha Cake with Coconut Frosting. This pound cake is a bit denser than a layer cake yet still moist and extremely flavourful. The kind of cake best served with a a cup of tea or coffee to get you through the lull of the afternoon. The cake itself stays moist and tender with a combination of real butter, coconut oil, and coconut milk. I had a feeling that matcha and coconut would go well together, but I was pleasantly surprised by how amazing the combo ended being. The mound of fluffy coconut frosting doesn't hurt either. 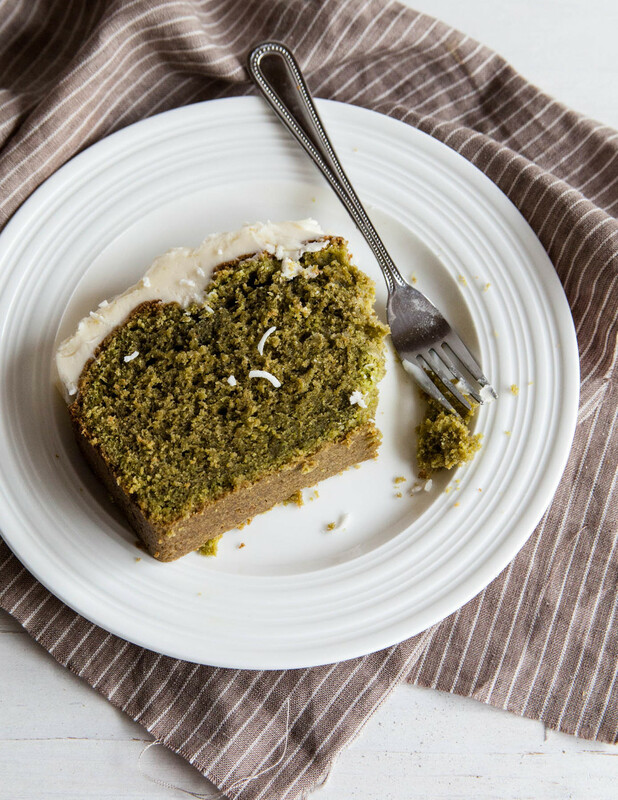 So if you are in need of an afternoon pick-me-up or are a little bit sleep deprived like me, make this cake and enjoy a slice with your bagillionth cup of joe or tea of the day. Preheat oven to 350 degrees. Grease and flour a large loaf pan and set aside. In the bowl of an electric mixer fitted with a paddle attachment, place the butter and coconut oil. With the mixer on medium, mix until combined. Add the sugar and mix on medium for about 3-5 minutes, or until creamed. Add in the vanilla and eggs, mixing well in between. Stop the mixer and scrape down the sides and bottom of the bowl. With the mixer on low and working in alternating batches, add in the flour mixture, yogurt, and coconut milk - starting and ending with the flour mixture. Mix on medium for no more than 30 seconds or until combined. Pour batter into the prepared loaf pan and bake for 45-60 minutes, or until a toothpick inserted in to the center of the cake comes out clean. Let cool on a wire rack for 15 minutes before removing cake from its pan. For the frosting, cream the butter with an electric mixer. Carefully add in the confectioner's sugar, coconut cream, and vanilla until combined. Mix on medium until frosting is smooth yet fluffy. 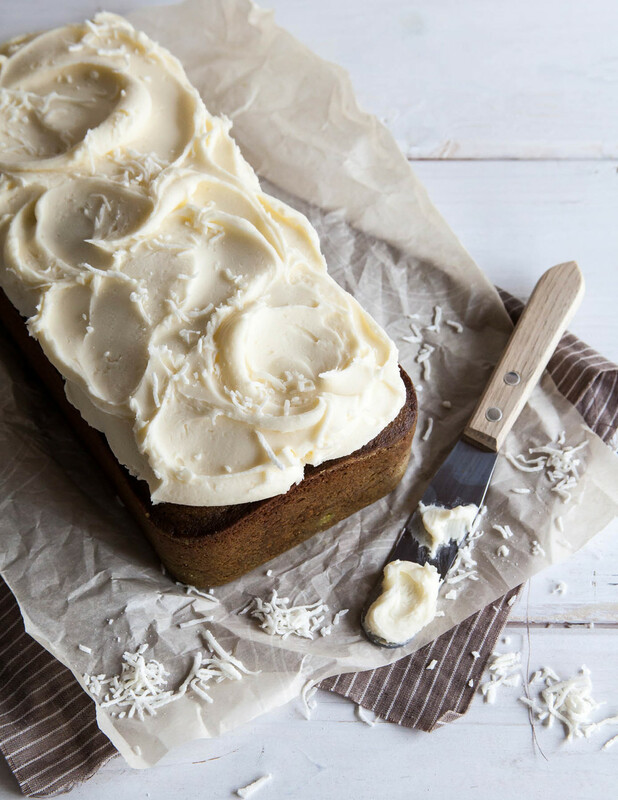 After the cake has completely cooled, swirl on the coconut frosting and sprinkle with shredded coconut, if desired. NOTE: If you find yourself with much more batter than your loaf pan will take, simply bake off any leftover batter in a smaller cake pan. Adjust time accordingly.